DECKER Design – This is our 2nd Generation uncoated composite decking range with embossed and brushed finishes that we have been selling as outdoor flooring in Australia since 2011. We supply direct from our warehouse to all of New South Wales and Queensland. Brushed one side, Embossed the other. We generally hold at least 100 square metres of each colour in stock in our warehouse and can deliver directly from our warehouse to all areas of New South Wales and Queensland within 3 to 7 days. Traditionally, we have carried four colours in our range of 2nd generation composite decking products, named after timber species. From 2018, we are introduced two new colours, effectively a dark grey and an antique white and renamed the colours after metals. There are a few reasons for this, but principally we believe composite decking should be considered more broadly than just a hardwood timber replacement and it is actually an outdoor flooring for decks, balconies and patios with many of the charachteristics of hardwood and some significant advantages in terms of colour choice and low maintenance. Our current colour range and the revised ”Metal” naming of decking boards for outdoor flooring are set out below. Each board has two finishes, a brushed or sanded finish on one side, and a woodgrain embossed finish on the other. Boards can be laid either way up. 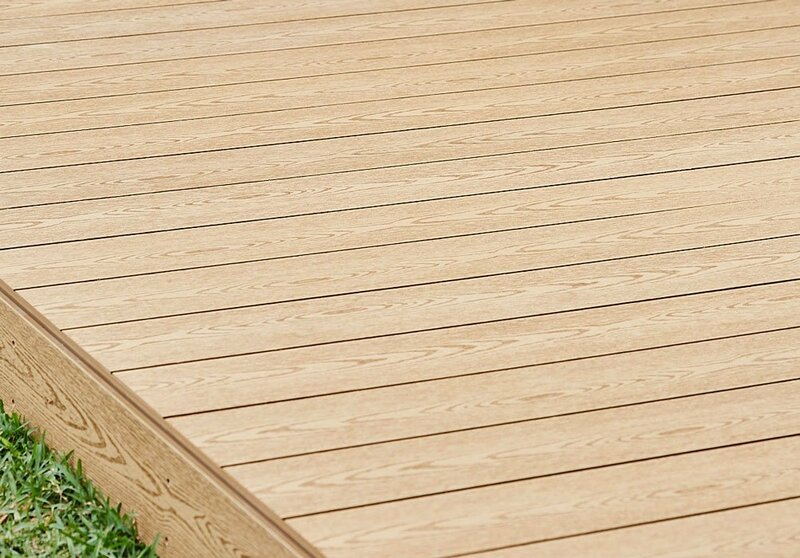 Our decking boards are ideal when you wish to replace am old timber deck. Our boards are suitable for 450mm joist spacing, the most common for timber decks. Simply rip up the existing decking boards and replace with DECKER DESIGN. Installation is so easy, it is quicker than removing an old deck. Have a look at the 2minute timelapse video of a 20m2 deck resurfaced with DECKER DESIGN Chromium. Finish off your deck with a matching Fascia Board – you can use decking boards as fascias or we offer brushed square edged boards to finish around the deck. 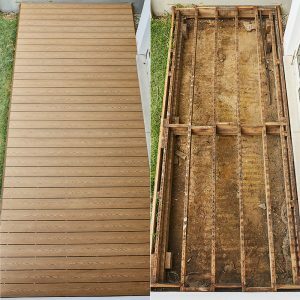 We also have brushed square edged screening boards, ideal for vertical or horizontal slat screening for privacy around your deck.